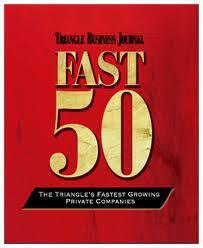 Yesterday, Triangle Business Journal announced the 2010 FAST 50 award winners. The celebratory awards dinner, honoring companies for their entrepreneurial excellence and achievements in the past year, is scheduled for November 4 at the Sheraton Imperial Hotel and Convention Center in RTP. Consolidated Asset Recovery Systems, Inc. The 2010 Fast 50 Awards program is a Triangle Business Journal event presented by PricewaterhouseCoopers and Bank of America and sponsored by USFalcon. Profiles of the honorees will be featured in a Fast 50 Awards special section that will be available in the Nov. 5 issue for subscribers and at Triangle Business Journal. Those interested in attending the event may register at TBJEVENTS.COM/fast50.